All pictures by Kenny Elrick. Due to the nature of the league structure, we can be playing at Balmedie, Banchory or Banff. And as a reward for my dedication, I like to treat myself – and the family – to a nice lunch now and again, trying out places we otherwise wouldn’t visit. On this particular Sunday, we were playing in Potterton, outside Aberdeen, so I had a quick scour about for nearby eateries. The one I settled upon was the fantastically named Beekie’s Neuk, in Newmachar, about 10 minutes from our match – a 7-7 draw which could only be described as “epic” by my nine-year-old. 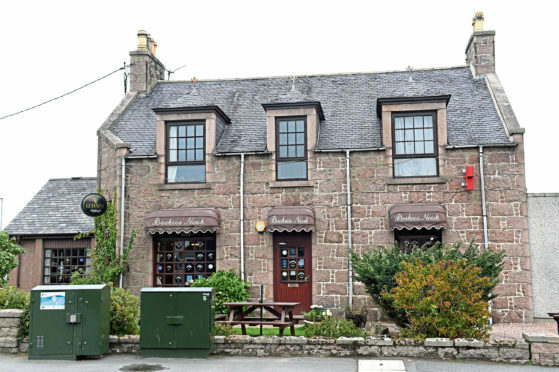 Beekie’s Neuk is on the main road through Newmachar so it is very easy to find, and on arrival we received a lovely warm welcome from a friendly young waitress. There is a bar to one side of the building and the couthy restaurant is on the other side, which is well thought out as it keeps the diners separate from the live football action on show next door. The decor in the restaurant is homely and welcoming, with an open fire sitting ready for the winter months just around the corner. I liked the wooden ceiling beams and exposed stone walls, while a large collection of decorative plates, whisky bottles and golfing memorabilia added a personal touch to the surroundings. Studying the menu took us some time as there is a large selection of dishes to choose from. In fact, we had to ask for more time to decide, such was the choice on offer. I really liked the sound of the seafood mornay, but also fancied a meaty dish, so in the end I compromised and chose the Cullen skink to start and beef olives for the main. My vegetarian wife was pleased to see a separate veggie section in the menu – always commendable these days – and so chose the deep-fried mushrooms with garlic mayo to start followed by the mushroom and pepper stroganoff for mains, which came with a brandy and paprika sauce and tagliatelle. Hungry after his football, the next Lionel Messi wanted to eat from the adult menu so ordered the haggis balls starter followed by the smothered chicken, from the Beekie’s specialities section. Our five-year-old daughter chose a pizza with beans from the kids’ menu, but insisted on sharing the haggis balls with her brother. My Cullen skink was lovely and creamy with a buttery finish, and was served with brown bread and butter. While I would have preferred it a little bit chunkier, I really enjoyed the flavour. My wife’s garlic mushrooms were described as delicious, while the haggis balls, served with a fresh salad and mango chutney, disappeared from the plate as if vanished by a magician. Always a good sign, considering how fussy children can be. Beef olives always give me the feeling of home, and that’s exactly how I felt eating these ones, which came from the Old Favourites section of the menu. Prime braised steak stuffed with oatmeal and prepared in a rich gravy, this was a lovely, hearty dish. The only minor complaint was that I would have liked a little more gravy to add some extra moisture to the oatmeal, but overall I thoroughly enjoyed this classic dish. Unusually, my wife’s mushroom and pepper stroganoff was served with tagliatelle rather than rice. While she admitted she’d have preferred it with rice, the stroganoff itself could not be faulted. My son’s smothered chicken was enormous, but he made a good fist of finishing it. But as all good dads do, I generously gave him some help. 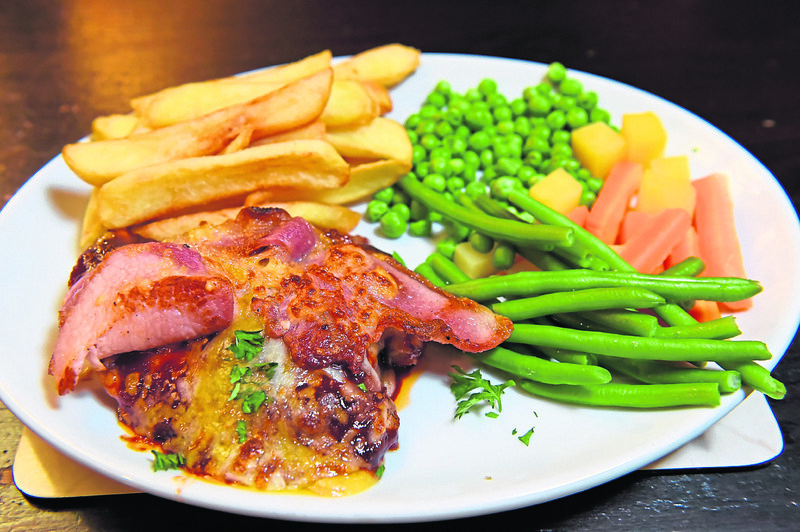 The chicken was topped with bacon and smothered in barbecue sauce, with both mozzarella and cheddar cheese melted on top to add extra flavour. I really liked the barbecue sauce, which had a subtle hint of bourbon in it, giving it a little twist on the norm. Despite being absolutely stuffed from the generous portions, I simply had to try the peanut butter and chocolate cheesecake from the impressive specials board, and it did not let me down. The cheesecake was pleasingly light and the peanut butter taste did not overwhelm it. A lovely way to round off a very enjoyable family meal. And that is exactly what the Reid family are going for at Beekie’s Neuk. 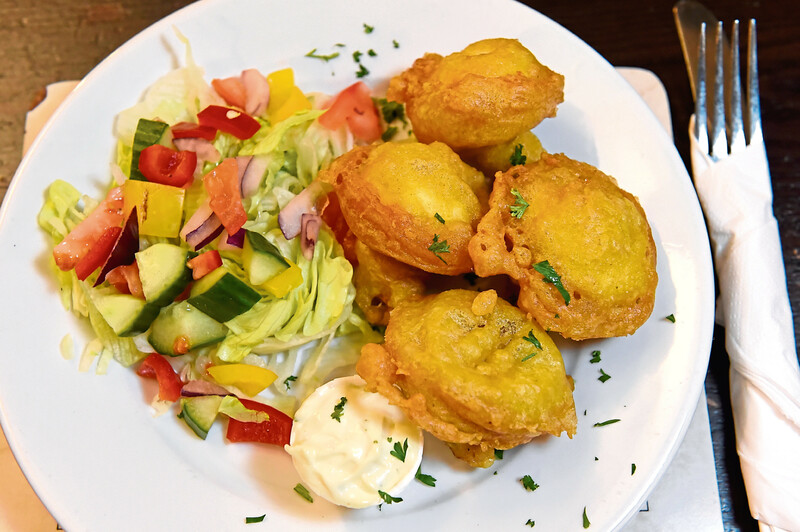 Having served the local community for more than 60 years, they pride themselves on offering a warm welcome and a relaxed dining experience for the entire family. 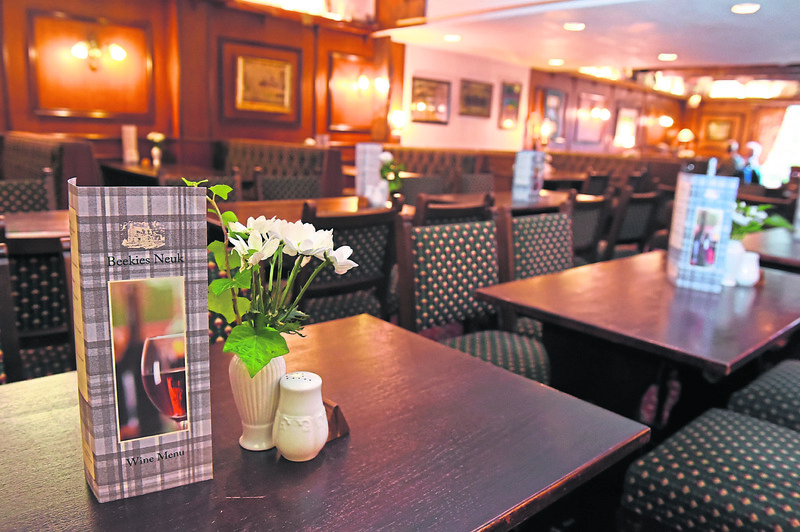 They also like to promote local suppliers and give mention to a number of them on the menu, including Piper Seafood, Sims Fruit and Aberdeenshire Larder, to name but a few. We thoroughly enjoyed our first visit here, and I can see why Beekie’s Neuk has stood the test of time in Newmachar. With food like this so nearby, roll on the next fixture in Potterton so we can enjoy some more gems from this bountiful menu.